Call me faint-hearted, but I don’t like roller coasters. Several summers ago, I caved in to my teenage son’s plea to join him on Dueling Dragons at Universal Studios. Everyone disembarking from the ride couldn’t stop raving about what they had just experienced. It must be enjoyable, I reasoned as I waited in the long, twisting lines. My son reassured me the ride would be fabulous, but after a nearly 2 ½ minute ride, I came to the conclusion that hurtling along at 55 mph and plunging 125 feet while zero-g-forces threatened to implode my skull was not for me. My risk taking son on the other hand, couldn’t get enough. 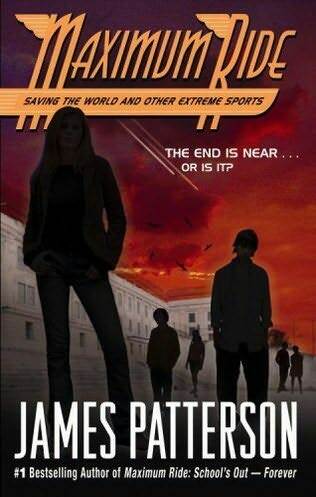 When I received my complimentary copy of James Patterson’s Maximum Ride: Saving the World and Other Extreme Sports in the mail, I was eager for the opportunity to read the latest and greatest in young adult science fiction. As an avid reader of young adult literature (but totally unfamiliar with James Patterson,) I had high expectations. The reviews were glowing, the praise almost exorbitant with the book jacket claiming “James Patterson has called Maximum Ride the best story he’s ever written.” A bit doubtful, I picked up the book, curious to see if indeed Patterson’s third book in the series, a fast-paced story about six bird kids fighting back against their evil-scientist creators, would sustain my interest. It didn’t take me long to realize that 60-year-old Patterson is a “literary machine” who knows exactly how to effectively reach his intended audience. The author has sold more than 135 million books during his 30-year career and has recently turned to writing for young adults in the hope that he can turn them on to reading. In fact, the dedication page in this book reads: “for everybody out there who might love books, if they were given books that loved them back”—a worthy and admirable goal for any author. But even though I found the premise of the book interesting—the ethics surrounding the idea of recombinant life forms—I have to admit I found myself distracted and uninspired by the voice in this work. At times, my reading felt like a bumpy and uneven ride as I tried to hold onto the plot and dialogue through clumsy scene changes and point of view. Bored with weak adjectives (such as “freaking”), the standard use of expletives, predictable plot, and lackluster characters, I truly wanted to care about Max and her flock, but after 400 pages devoid of sensory imagery and detail, I put the book down impassively. Frankly, I have to voice my dissent. I believe there are better young adult science fiction books out there that are more compelling and more worthy of young people’s time. Jeanne DuPrau’s trilogy—The City of Ember, The People of Sparks, and The Prophet of Yonwood—come to mind as do Madeleine L’Engle’s Wrinkle in Time and Lois Lowry’s The Giver. Like Patterson, I want kids to find books that speak to them. Clearly, the Harry Potter craze has shown that our young people have it in them to stick with challenging reads and longer chapter books when they are mesmerized by excellent writing. Still, in spite of its faults, the Maximum Ride series will probably continue to attract readers who prefer ease, entertainment, and accessibility. And who knows? It may be the beckoning portal or nudge that leads some kids to venture further into the realm of literacy. This review is sponsored by Mother Talk.